Though synaesthesia can be something of a gift or hindrance to people who are born with, it is also possible to see it as a psychological option when categorising elements of everyday life. Perhaps unconsciously aware that an object or thing is producing a stimulus associated with another sense entirely, the phenomena of people rationalising something like music into colour has been around for centuries. It is with this slightly academic approach that leads to another topic of discussion within Doctor Who; can someone see an episode or story in a particular colour or more specifically, a colour outside of the visual palette of the story? As fans, we are some of the most meticulous in putting things in form and order. DVD sleeves must often be exact in order. We go out of the way to buy new editions of stories already owned simply because the cover has been updated to fit the, now formalised, colour constructs and pictures that represent each Doctor. Talented people even go so far as to make their own covers for missing episodes in the exact format and colouring of the official DVD’s to put their reconstructions and audios in. This is dedication but, as a fan that has developed a vague synaesthetic relationship with a large number of Doctor Who episodes through the years of VHS fetishisation and obsession, I believe there is much to this than a mere reaching for perfection that lies yonder out of reach. Contrary to what many fans call the dark days of Doctor Who, the 1990s were great for a small number of fans; fans that were lucky enough to be born at the right age to discover the whole previous 26 years of Doctor Who while fandom had to patiently wait until 1996 and then again for 2005 for anything new on Television. Discovering, becoming obsessed with and living the first 26 years in a fraction of the time the original run took has no doubt had an effect on the way those fans, including myself, see episodes of Doctor Who, both in recollection and in general discussion. The first link that can be made between relating a story to colour and where this logic came about can be seen in the VHS years that Doctor Who took to after 1989. This might seem quite general but when recounting the rabid nature that built around collecting Doctor Who on VHS after the deletion of many sort after titles, might go some way to explain this. 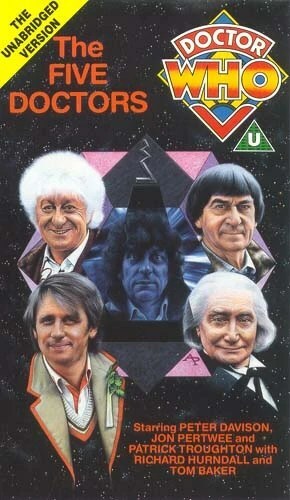 My first story was The Five Doctors (1983); an absolute can of worms when discussing “who was your first Doctor?”. Well effectively it was William Hartnell in a clip from The Dalek’s Invasion of Earth (1964) in a very yellow tinted film of black and white. However this opening of the story does little to prevent viewing it as a story of metallic grey with strips of red when first visualising it. This is an image born from a number of aspects. The story itself, with its grey slate quarries and metallic corridors seems to be the basis for this but for the red stripes it is more complex. Could it be the camp, failed machismo of the chancellery guard, the lasers that fire down on the Master or maybe even the light of the homing beacon in the calling device? In fact it is down to two aspects that came about both before and after the story. The first is the cover of the VHS with its red typographies both on its spine and on the front (this is the early version of the release and not the later version with firey cover). The second is from the Target novelisation with its striking red border over gleaming metallic background, making it the most exciting book in the library for a seven year old version of myself. This seems a very basic and almost flimsy telling of association building but having looked back on why this relationship has built up, it seems clear that this has to bear some responsibility, not just on this story but many others too. The Five Doctors represents a starting point for a fan. Already there were five potential door ways to explore in the form of Doctors, the 30th anniversary editions of older episodes were starting to be released in droves and there was much to explore, even with the likes of colourful old DWMs of my father’s. Some fans think of stories by recounting the correct serial numbers (an art that is dying out for better or for worse) while others perhaps simply categorise by basic elements such as era, Doctor, monster and so on. The more stories that were bought and experienced the more it became clear that the stories were being recalled, not by the actual colours of the stories themselves but by colours of the sleeves of the video cassettes. As the video market for Doctor Who took off for proper (thankfully if the stories of paying astronomical amounts of money for second generation Revenge of the Cybermen (1975) copies are anything to go by), the 30th anniversary produced the most solid range of cover artwork for Doctor Who ever made. 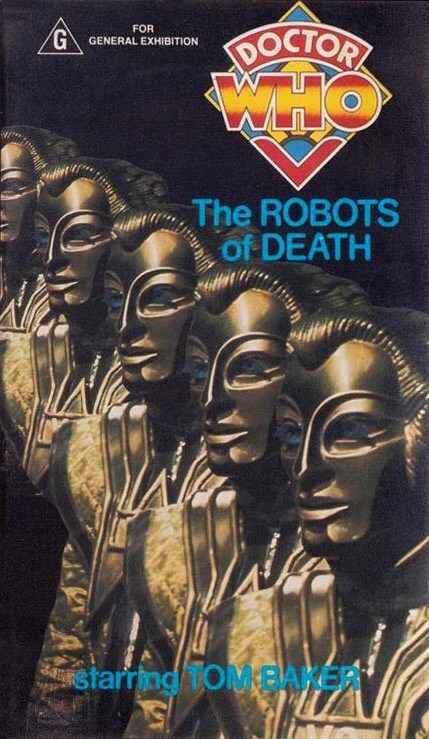 Stories had photo-realistic paintings, full of colour and bravado a mile away from the early photo montages of Pyramids of Mars (1975) of The Robots of Death (1977). Recalling these stories is somewhat difficult in terms of colour. The latter is perhaps more easily associated with the metallic green masks of the Voc robots while the former vaguely recalls the garish yellow band that held the story title on its cover. These photo-print covers did little for the imagination, especially in terms of colour. With this in mind it is interesting to note the old BBC Video introduction found on The Robots of Death and a number of other titles. 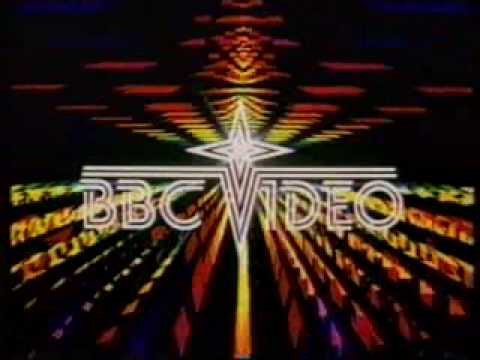 Before the story starts, the viewer was treated to a multi-colour extravaganza of tinny, late 1980s video art. Everything from the music to the shades of colours came to represent The Robots of Death. The colour on the cover was so uninspiring (surprisingly so considering the wonderfully purple desert and the Art Deco killer robots) that it seemed natural to associate it with a cacophony of bright colours, even if the story was largely subdued with its beige corridors, juxtaposed to its luscious costumes. The photo covers were not however always a bad thing and more will be discussed about them in the next part. This however was just the beginning and, with the 30th anniversary videos being made available from Woolworth’s to HMV, this was only the start of an extremely complex relationship between colour and Doctor Who. DVD Images from House of Geekery, The Doctor Who Collector’s Wiki and Article.Wn. I love Dr. Who, but I have, honest to goodness, no idea what you’re talking about. Do I have to be British? Not at all though I’m unsure how much synaesthesia is discussed where you are. Basically it’s about mixing up senses and recalling and formalising things by senses (e.g sight and colour) with things that don’t necessarily stimulate that sense. I recall Doctor Who episodes through colour. This is the first of a few articles explaining why. Oh please. Go back to the Gallifrey base troll dungeon.